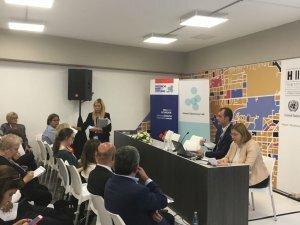 The Association of Social Democratic Municipalities, Turkey, in partnership with the Friedrich-Ebert-Stiftung, Turkey, and the Global Diplomacy Lab was organising a networking event entitled “Cities Combating Urban Poverty” at the HABITAT III Conference. The progressive urbanisation of the globe and increasing responsibilities of local authorities together with civil society are two trends that are shaping international cooperation. Cities are becoming centres of vastly dynamic economies. Massive population shifts to urban areas are the result. The large majority of these populations end up in poverty-stricken informal settlements, which create persistent problems regarding unemployment, exclusion and poverty. At the event, casual labourers took the floor together with international organisations, mayors, civil society practitioners, scholars and donors to develop global agendas and local solutions on urban poverty. The essential objective of this networking event is to discuss how global cooperation and commitment to poverty reduction can be incentivised among cities. The participants considered how a commitment agreement can be developed among cities. The networking event was scheduled to take place in room MR18 at the venue of the Habitat III Conference, Casa de la Cultura Ecuatoriana “Benjamin Carrion” from 4.30 to 6.30 p.m. on 19 October.